The best part about the holiday season is exchanging of gifts. We dont celebrate Christmas at our place but since my sister had her engagement this week I wanted to make this time special for her and decided to bring back some school memories by playing secret santa to her. Secret santa is a game we 3 sisters played with our school friends years ago . In this game we wrote all our names on chits and everyone would randomly pick one name then get a gift for the same person on Christmas eve to celebrate the season of cheer and happiness. Choosing a gift for my sister is very difficult because she is very picky so I wanted safe and decided to gift her something she totally loves aka skin care and makeup. 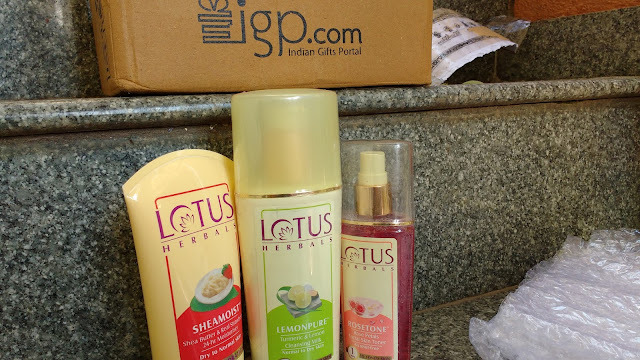 I found out about IGP.com which is India's largest online gifting store and was impressed with beauty hampers on their site. I zeroed in on the Lotus herbals beauty hamper for my sister and today I will share my detailed shopping experience . IGP.com is one of India’s largest online gifts store specializing in gifts for all ages and occasions. IGP also known as Indian gifts portal was established in 2001 and specializes in flowers, cakes, chocolates, personalized products, festival merchandise, kids, home & living and fashion categories. Choosing the right gift can be very tricky but IGP helps make gifting a delightful experience. Even if you have nothing particular in mind IGP.com can help you get a perfect gift as they have neatly categorized gifts to shop by occasion, recipient, relationship and festival. So if you are looking for gifts for mom or for your baby nephew you can easily browse to the proper category and explore options keeping your budget in mind. I wanted a beauty related gift so I chose the fashion and lifestyle category and explored options under beauty and personal care gifts. 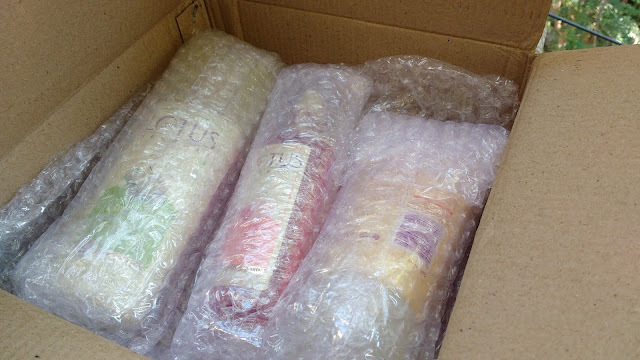 I loved the variety of gift hampers available and chose the Lotus CTM routine trio gift pack. I added the item to my cart and proceeded to check out where I was asked to register with email and password before completing the payment process. Payment process is simple . You can pay with Credit or Debit Card, Net Banking, wallets like Paytm and mobikwik and even Paypal . Shipping: Varied delivery options are offered by IGP and the best thing about them is that they ship gifts to other countries. If you want to send a gift to your friends in a different country you can do it conveniently with Indian gifts portal. I was gifting to my sister so i chose standard delivery and shipped it to my home address. My order was placed on 21st of December and I received it in 2 days well in advance before Xmas. 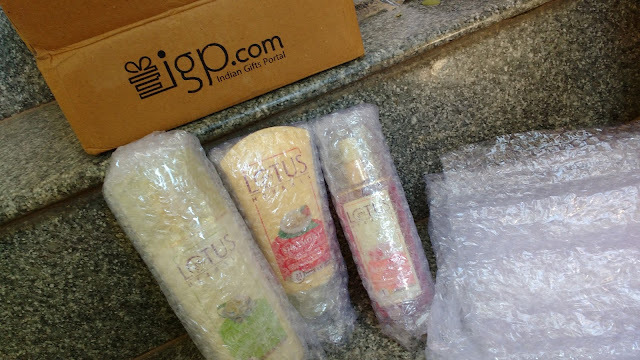 Packaging: The gift hamper I ordered was carefully bubble wrapped and packed nicely in a cardboard box with no chance of leakage of the skin care products. My sister loved this unexpected gift and rushed to open it . I liked that IGP had MRP scribbled out on all three products which is something I always do. I dont like people to know exactly how much I spent on their gift . Customer service : For any clarification or queries you can call IGP on +91-(22) 4343-3333 or mail them at support@igp.com . Why choose IGP.com for gifting ? * Wide range of gifting categories available including cakes, flowers, curated hampers and personlized gifts. 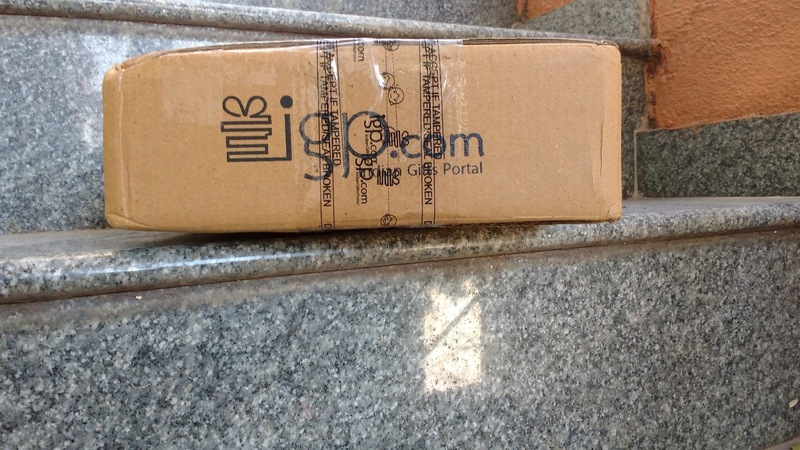 * IGP offers Free shipping in India to 7,000+ pin codes . You can choose standard delivery or a tentative delivery date according to your convenience. * Indian Gifts Portal (IGP.com) Makes international gifting possible by delivering to 150+ countries (including USA, UK, Australia, Canada etc) . * Last minute gifting is also facilitated by IGP and they have same day delivery network in 300 cities in India. Yes, I would definitely recommend IGP to surprise your loved ones with unique gifts especially if they live abroad. Do check out their curated hampers collections if you are out of gift ideas, I personally love their fashion and lifestyle gift hampers a lot. Overall I had a great experience with IGP.com and you should definitely try this website to make gifting a fun and delightful this new year. 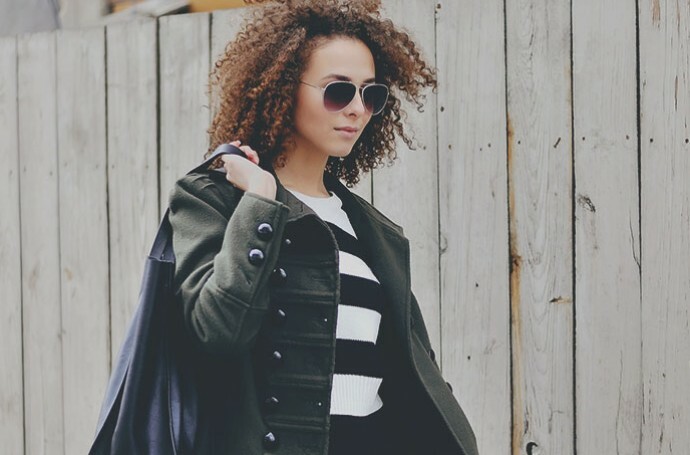 Have you shopped from IGP.com ? Tell me about your experience.